Earl Bullock is a dedicated senior from the Ballou High School just keep livin program in Washington D.C. Earl is excited to enter his 2nd year in the JKL program! Last year he experienced a lot of firsts, including his first time running a 5k race, taking a spin class and choosing to make healthy food choices. During his 9th & 10th grade year Earl was not able to join the JKL program due to his family responsibilities as an awesome big brother. Every day after school he would pick up his younger sister and make sure she got home safe. Earl is a young man who has a positive outlook on life and is now taking full advantage of the JKL resources. We were honored to have him as the JKL student speaker for the Redskins ‘Welcome Home Luncheon” this past August. After high school, Earl is hoping to attend Florida State University to study business administration and to one day, open his own mechanic shop in his neighborhood. "I’m grateful to my parents for coming to this country and making a better life for us." It was an honor for our Founders, Matthew McConaughey and Camila Alves, to participate in the Cantor Fitzgerald/BGC Partners Charity Day 2018 on September 11th. Every year, Cantor Fitzgerald and their affiliates, BGC Partners and GFI Group, in conjunction with the Cantor Fitzgerald Relief Fund, commemorate their 658 friends and colleagues and 61 Eurobrokers employees who perished on September 11, 2001 by distributing 100% of their global revenues on Charity Day to the Cantor Fitzgerald Relief Fund and dozens of charities around the world, including j.k. livin. Matthew and Camila had the opportunity to visit their offices and Matthew even got to jump on the phone with clients and help conduct trades while he was there. We were all touched and moved to be a part of this special event. On Thursday, September 27th, Samsung held their 17th Annual Charitable Gala at the Manhattan Center in New York. This annual event brings together luminaries from across the worlds of entertainment and business to help raise awareness for a variety of important social and charitable programs, with the primary goal of raising funds to help people build brighter futures. We are so grateful to Samsung for choosing the just keep livin Foundation as one of the beneficiaries for this amazing event! The event was attended by three of just keep livin’s finest, Aaliyah Williams and Aaliyah Clark who are two members of the Anacostia JKL team as well as Tiffany Gill who is one of our JKL instructors in D.C. Both Aaliyahs took over the social media coverage of the event! It was a fun filled evening for all! A heartfelt thank you to Samsung for their continued support! On Sunday September 30, over 80 of our Los Angeles just keep livin students participated in the Los Angeles Dodgers Foundation 5K race, for the 3rd year in a row. This race is an event we always look forward to participating in because The Los Angeles Dodgers Foundation has been a great sponsor and partner in providing top-notch experiences for our JKL students. Our students love the course, the energy of all the runners and the field tour at the end of the race! Fitness is one of our key elements and what better way to incorporate a day of fitness than with competitive smiles and local city pride. Thank you to the Dodgers Foundation, we are looking forward to year 4! 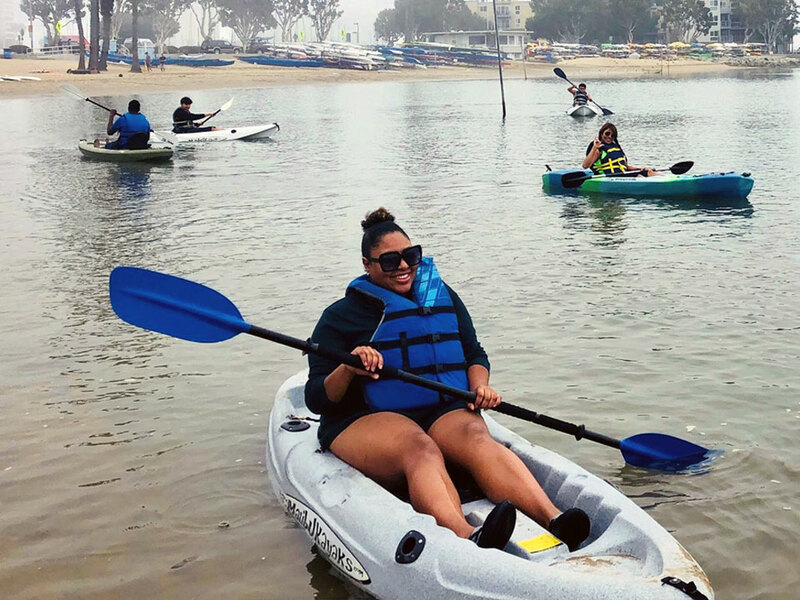 Venice JKL Program Goes Kayaking! On Saturday, September 8th, our JKL instructors at Venice High School took their program kayaking in Marina Del Ray, California. This fun-filled day provided their students an opportunity to get out on the water and just explore through the channel! JKL instructor Cam David said, “Once the students put on their safety gear, practiced the forward stroke on the paddle, they were on their way and had an absolute blast!” Students expressed that for many, this was their first time kayaking and they were surprised at how paddling at a steady pace had them breathing fast and their hearts pumping! This fun and memorable event left a lasting impression on our students and it was a day they won’t soon forget! Life gets busy, and sometimes you just can’t do it all! I have learned that it is better to go easy on yourself, and know that as long as you are doing your best, you’re doing fine! Last year I got invited to a friend’s Halloween party, and had no time to bring a treat. I improvised and got a store bought cake, and added a carrot nose, googly eyes and a little witch hat — It was an easy + fun solution, and saved me a lot of time! Now this is a picture worthy breakfast! Pictures of smoothie bowls have been all over the place lately. Instead of buying one that’s packed with sugar and super high in calories, why not make one that’s super nutritious, and totally unique to you. Once you make the smoothie, you’re free to add your favorite fruits, nuts, seeds! I personally love adding bananas, raspberries, and pepita seeds. The Beller Basic Smoothie Bowl contains Healthy fats from chia seeds, fiber and tons of important minerals and vitamins from banana and spinach. Get creative, and enjoy! 1. Place all ingredients in a high-powered blender and puree until smooth. Let's hear it for the red, white and blue! Show your support by sportin' this light blue shirt with red/white/blue screenprint on front and red screenprint on back yoke.